Rachael Ray must be doing a V-I-C-T-O-R-Y chant somewhere. She currently has two books on the NY Times Best Sellers List! 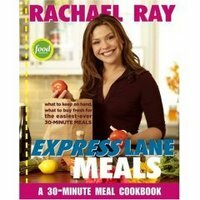 Express Lane Meals debuted at number one in its first week on the list. 365: No Repeats is at number 6 and has been on the list for 25 weeks. If I had to pick just one to try first, it would probably be 365: No Repeats, only because there are, well, 365 recipes in there. And I like that it attempts to teach you how to cook without a recipe (a skill that is currently beyond my cooking abilities) by showing how ingredients can be swapped to create new dishes. Although, if you really are interested in meals that will require the least amount of time, Express Lane Meals is probably your best bet because it emphasizes a system for getting in and out of the store quickly,being organized, and planning ahead. Okay, so I guess I couldn't really pick between the two. Can I have an E for effort?